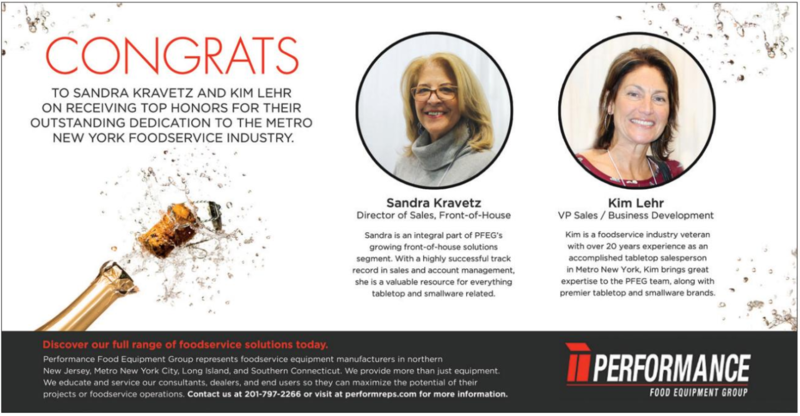 Congratulations to Sandra Kravetz and Kim Lehr-McKeown for their recent recognition in the TotalFoodService 2019 Top Women in Metro New York Foodservice & Hospitality edition. The edition, presented by the Women's Foodservice Forum, is the result of a year in Tri-State foodservice that was largely driven by women. Sandra Kravetz is the Director of Sales at Performance Food Equipment Group. She possesses an extensive background in the hospitality and foodservice industries. Kravetz’s tenure in the foodservice industry began at Coca-Cola, where she was a business development manager. Next, she moved on to Bon Chef. Continuing on a foodservice path, Kravetz spent some time working at M. Tucker, and then stepped into her current position at Performance Food Equipment. Over the course of her career, she has acquired a strong skill set and gained a thorough knowledge and understanding of the foodservice industry. Exceptional customer service is certainly among Kravetz’s expertise. “Chefs are artists, and I am very passionate about tabletop. I really work to capture their vision and incorporate it into the project,” said Kravetz. Kim Lehr is a sales associate at Performance Food Equipment Group. Her extensive career in foodservice has spanned over two decades. Lehr’s great experience in tabletop coupled with her proficiency in sales has made her a strong asset for Performance Food Equipment. Lehr’s career has evolved over the course of twenty years. She launched Lehr Marketing, and later moved on to Lehr McKeown. Next, she joined Performance Food Equipment Group, where she incorporates her skills in sales. Lehr’s career has given her a strong understanding of foodservice, and great insight into the industry. “The foodservice industry has evolved tremendously. It’s becoming a younger sector, and I love working with newcomers who may have transitioned into foodservice from a different industry. I’ve found my work to be really fun and exciting – It challenges me every day, and I like that,” Lehr said. Get to know the Tri-State Area foodservice equipment industry a little better. Read the Intro to Foodservice Equipment Solutions.